Many times we meet at funerals or memorial celebrations of life. Many times we meet someone or get to know someone when they have become an ancestor. This is a part of living, dying, and getting to know one another and actually feeling another person's presence through others. It is a part of our oral tradition. We went through a lot together as community, family and extended family to get to the Going Home Celebration of Life for Elder Adunni Oshupa Tabasi. We experienced mountains of tribulations and revelations. We had difficulty letting go. While we were trying to let go we were still remembering and mourning at the same time. Emotions were high at times and sometimes we were even shrouded in confusion and strife. We had a long mourning and it is a long way home for Elder Adunni Oshupa Tabasi. 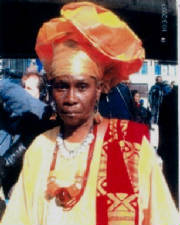 One of her most passionate wishes was for us to go back to where we came from (Afrika). “We did not give up our citizenship, we are Captive Afrikan Survivor refugees, claiming our land, history and our Identity”. Through the ordeal of organizing I witnessed the depth of the tensions between us. The tensions that make it difficult for us to be able to see the light in which we need to see or hear each other fully in order to build. We need to rid ourselves of the many tensions between us in order to do what needs to be done and to undo our predicament. Elder Adunni Oshpa Tabbsi left us with a lot of work to do. Thoughts of what to do and what we needed to do as a people just flowed through her creative mind. She tried to do it all. Her mind was so keen in perception and her eyes were intense at times. She knew how to dig, to dig beneath the surface, and she preached daily that we must learn to write our history. She had a library of information in her mind. The many topics she would talk about were always intriguing.She would talk about Marcus Garvey and the W.E.B. Dubois debacle, George Washington Carver and Booker T. Washington. How we had been lead astray by integration and this need to be accepted by our enemies. She would say the "Stockholm Syndrome in us". She talked about Afrikan culture, cuisine and I remember her mentioning to me about a group of women in Afrika on several occasions who would keep remaking their clothes from patches of fabric scraps. We talked about the Laughing Barrel (which tried to suppress our laughter), the genius of George W. Carver and Booker T. Washington and how misunderstood they are. We would talk about Louisiana and Katrina and the history of Louisiana and the turn of the century race riot and Robert Charles, the Gullahs and who they really were. She was always taking the fake covers off of what we had been told. She wanted us to lift the veil and to constantly rediscover and find those lost souls that fought for us that are hidden and buried. And the need for us to become workers like bees and spiders. There was no end to Elder Adunni's topics of interest.